Orchid On A Stick - How Orchids Grow In The Wild ! What is An Orchid On A Stick? Many orchids are epiphytes and as such naturally grow on trees and branches when they are found in the wild. When growing orchids, we can often imitate nature (often a good idea!). We can provide the perfect growing environment and situation for these kind of orchids just as you might find in the wild. Many orchids can be grown this way. Some examples of epiphyte orchids are Phalaenopsis and Oncidium. Many other orchids that are epiphytes could be listed. Pleurothallis, Bulbophyllum, Neofinetia falcata and many others are epiphytic orchids. Phalaenopsis and Oncidium are just two common ones. Orchid plants can be strikingly beautiful when mounted and grown in this fashion and are a wonderful addition to any orchid collection. Orchids grown in this way actually look the way an orchid would look growing in the wild. Its roots are attached to a tree trunk or a branch. In cultivation, these are called mounted orchids. 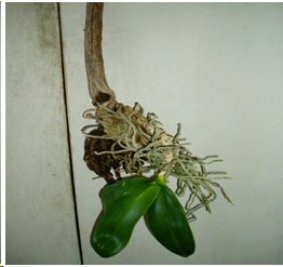 Mounted orchids can be attached to sticks or branches. They can also be attached to tree fern rafts or sea shells or even little wire frames. They just need a little moss and something to hold the plant to the mount until it grows enough roots to hold itself to the mount. In the more tropical areas where orchids are common outside, they are often attached to trees trunks or branches in the garden. There they are allowed to grow and bloom just as if they had grown there naturally. These are a wonderful addition to any garden environment. Often orchids grown in this fashion are a little smaller. Some orchids grown in this way are fairly easy to grow. But sometimes they can be more challenging. It is important to know the kind of orchid before you mount it on a stick. Water management when growing on this media can be critical to the orchids health. The stick media tends to dry out more frequently so depending on the environment more frequent watering may be necessary. Some of the growing requirements can be more rigorous for mounted orchids. Various kinds of genera can be grown in this fashion. And there are different orchids for different environments, from the steamy, warm rain forests to the cooler cloud forests like the highlands of Peru and Costa Rica. Many of the species orchid growers (growers that focus on the species orchids and not the hybrids) tend to grow orchids in this fashion. And some of the species that they offer for sale are the more exotic and unusual orchids. Some growers just specialize in these kind of species orchids, orchid on a stick. I encourage you to try growing orchids on a stick as this may be very suited to your orchid growing environment.